Two moms walk into a coffee shop. Both moms knew each other only by face, but fate steered them into an accidental conversation that changed their lives - forever! The two of them end up talking for hours about life as women who juggle families, jobs, volunteer responsibilities, school, and aging parents (not to mention puppies! ), all the while struggling to find balance, especially with children that struggle with anxiety, perfectionism and tender hearts that can be quickly chewed up in an often unforgiving school setting. Sounding a bit more familiar? …These two moms go on to find out just how relieved they were for being able to talk about these struggles – because so often they have feared the repercussions of judgement or gossip or no one really understanding what they are going through. But as they continued to talk and laugh (and sometimes cry!) about the real struggles of life and parenting their anxious children, they began to see that, in their role as health coaches (even health coaches are not immune from the inevitable stress of life!! ), they could reach other parents in similar situations with support, understanding and STRATEGIES for coping with all that life throws at us. The strategies are multiple; they include everything from mindfulness to nutrition to movement (exercise) but nothing is prescriptive. We’ll never tell you what to eat or what not to eat or provide you with a one-size-fits all approach to exercise and stress management. But we will share ideas, offer recipes, suggest ways to develop a new relationship to exercise and nudge you toward enjoying life – as messy and chaotic as it is, most of the time. 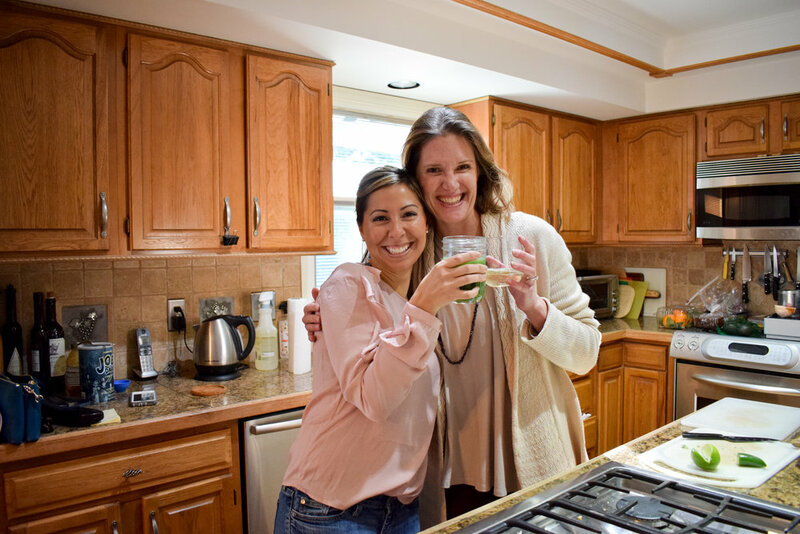 We are two moms with different lifestyles and interests – neither of us does “cookie cutter” anything! So, come join LifeSpaceHealth and find your tribe, find humor and tears, find answers and questions (we have a LOT of those!! ); here you’ll find mistakes and successes; and you’ll find REAL. Somie and Jennifer have been incorporating mindfulness into their own personal lives and into their health coaching practices for years. In their journey as health coaches, they discovered that many people had no idea about the benefits of mindfulness and how it could be implemented in their daily lives . Because let’s be real, who can go sit in a quiet room and “OM” for twenty minutes? NO? Not so much? That’s what we thought. And, to be honest, that’s really not what mindfulness is about anyway! What they learned was anxiety and stress really aren’t things to fix, or even things to manage or cope with, they need to be embraced. Yes, embraced! And by following Jennifer and Somie on their journey as two moms who teach children, families, classrooms and individuals how to embrace the present moment, they will teach you that you too can live a fulfilling happy life, and even get to tuck those children in with out the tears and catch up on some of the things that makes mom happy. Even if it’s an episode of make believe. Real solutions that may or may not work all the time. But we promise we’ll keep working with you to find what helps you feel more in control, more grounded, healthier, happier – more YOU!